Report by the Congress for the New Urbanism identifies the ten greatest opportunities in America for replacing aging urban highways with boulevards or avenues and reconnecting the surrounding neighborhoods. Since the Federal-Aid Highway Act of 1956, America has spent billions to create the Interstate Highway System- an ongoing march of construction and investment that has fundamentally reshaped our regions, cities, towns and rural places. That same highway infrastructure, however, came as a blight on urban neighborhoods, with disastrous consequences for cities. Both research and the experience of residents reveals that urban highways have placed undue burdens on disadvantaged and vulnerable populations. Fortunately, trailblazing cities around the world have proven highway removal is a viable alternative—saving tax dollars, adding value to local tax bases, and significantly improving neighborhoods without choking traffic. Communities across North America are facing a watershed moment in the history of our transportation infrastructure. With cities, citizens, and transportation officials all looking for alternatives to costly highway repair and expansion, these ten campaigns offer a roadmap to better health, equity, opportunity, and connectivity in every neighborhood, while reversing decades of decline and disinvestment. Freeways Without Futures 2017 brings together decades of lessons, resources, strategies, and sweat equity into a comprehensive look at the current state of urban highway removal. This report sets out to empower local highway teardown advocates, political leaders, and forward-thinking engineers working in their communities to forge ahead. Above all, these ten highways are opportunities for progress. Each one presents the chance to remove a blight from the physical, economic, and environmental health of urban communities. Their intended benefits have not justified the tragic consequences, but converting these highways into human-scaled streets offers a chance to begin repairing the damage. From Buffalo to San Francisco, these are the freeways without futures. When the Scajaquada Expressway was built along New York State Route 198 in Buffalo, it bisected and severed Delaware Park—a masterpiece designed by the celebrated urbanist Frederick Law Olmsted. In May 2015, the decades-long safety consequences of that decision reached a breaking point when a sedan traveling on the expressway jumped a barrier, veered into Delaware Park, killed a three-year-old boy, and severely injured his five-year-old sister. Constructed in the early 1960s, the 3.6-mile four-lane highway carries between 37,600 and 65,000 vehicles per day between Interstate 190 and State Route 33, another expressway. In addition to cutting through Delaware Park, the Scajaquada runs alongside the 10,000-student campus of Buffalo State, approximately two miles north of downtown. For decades, community members have demanded that the expressway be redesigned as a parkway to cut noise, pollution, and dangerous high-speed traffic—and to reconnect Delaware Park to adjacent neighborhoods. Now, the project has support of Governor Andrew Cuomo, the New York State Department of Transportation (NYSDOT), and local Buffalo stakeholders. In 2005, the City of Buffalo and NYSDOT conducted a study known as the Expanded Project Proposal (EPP) to explore ways to redesign the Scajaquada and alleviate negative impacts on the community. 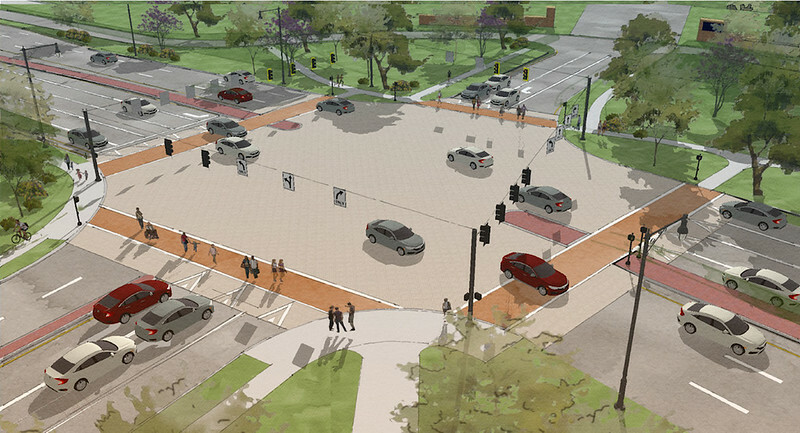 With significant public input, the EPP established a preferred design that reduced vehicular speed to 30 miles per hour, improved the aesthetic of the thoroughfare, and incorporated pedestrian crossings and bicycle lanes. In the summer of 2015, following the tragic crash, NYSDOT made swift short-term improvements, decreasing posted speeds from 50 to 30 mph, and reducing all 12-foot lanes to 11 feet. Later, the DOT installed raised-table pedestrian crosswalks, new, sturdier guard railings, and additional safety improvements. For the project, NYSDOT estimated a total construction cost of $115 million. Alternatives are being evaluated, and the Scajaquada Corridor Coalition, a group of local stakeholders, continues to push for more people-oriented design. 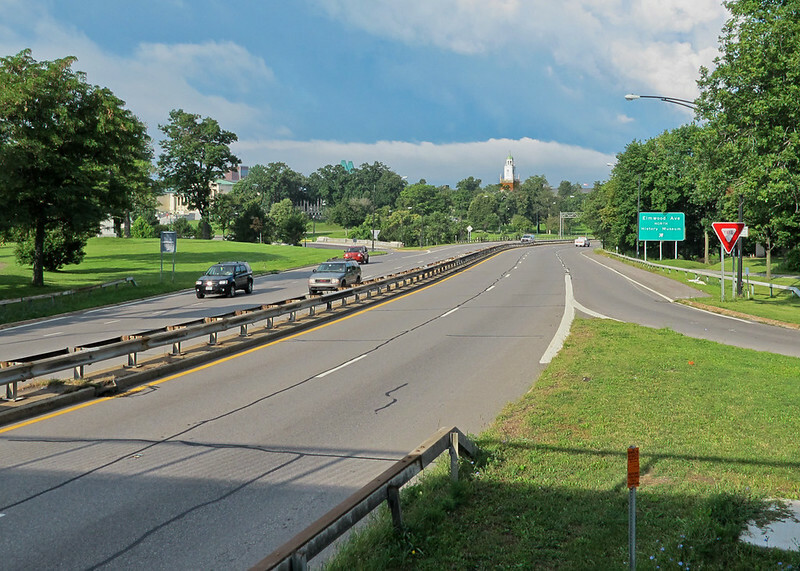 “At no additional cost, the community’s Scajaquada Boulevard vision could cement our city’s renaissance if vehicle traffic is not the sole consideration of its design; instead, people are,” says the coalition. Construction is expected to begin Winter of 2017/2018 and completed Fall 2018. For two generations, I-345 has been a fact of life in Dallas, Texas. Running almost two miles along its elevated course, the freeway cuts off downtown from the adjacent historic Deep Ellum neighborhood, a major 20th-century jazz and blues hotspot. Now, surrounded by vacant lots, empty streets, and disinvestment, the highway is nearing the end of its original design life. In Dallas, a pro-growth city, those numbers attracted significant attention. But, critics asked, what would happen to the cars and trucks? Luckily, a significant portion of I-345 includes regional traffic, which could shift to other options like Loop 12, Interstate 635, and Highway 190. Meanwhile, some local traffic might shift to walking or other modes—and the rest could be handled by the city’s grid, which has excess capacity. In the time since I-345 was built, the city has changed profoundly. Downtown Dallas has roared back to life since 2000, adding over 8,000 residents. Deep Ellum and nearby neighborhoods like it are also gaining residents—especially in the newly transit-connected Uptown and Oak Cliff areas. 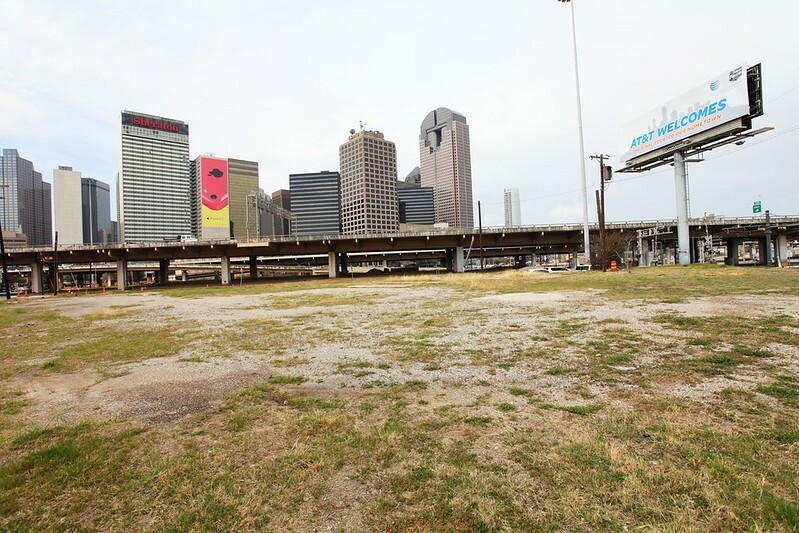 In this new urban environment, A New Dallas’s ideas garnered media attention, causing the Texas Department of Transportation (TxDOT) to abandon the nine options to rebuild the highway that they had originally presented. Most recently, the nonprofit A New Dallas has spawned the political action committee Coalition for A New Dallas, dedicated to revitalizing Dallas and electing, educating, and empowering elected officials. This extraordinarily diverse group, which unites grassroots activists with the local business community, has successfully persuaded TxDOT to launch CityMAP, a feasibility study of three options for I-345—including removal, a below-grade option, and a modified version that simply removes exit ramps. This document is the first of its kind to study the economic and quality-of-life impacts outside of the corridor boundaries. 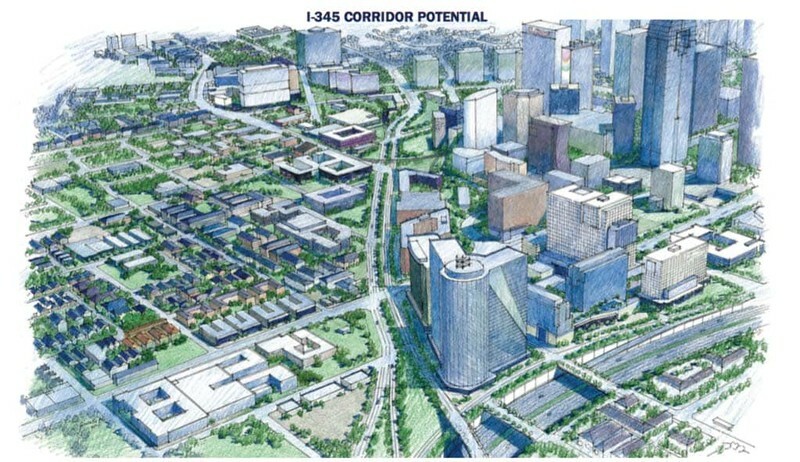 The report indicates that, thanks to the tireless effort of local activists and stakeholders, TxDOT is seriously considering a highway teardown for I-345 to make way for walkable development—a hugely forward-thinking step toward a high-performing urban transportation system.